The Colombian government has announced it is building a new military base on its border with Venezuela and has activated six new airborne battalions. Relations between the two nations are at a historic low with Venezuelan President Hugo Chavez already telling his generals to prepare for war. He moved 15,000 more troops up to the border, accusing Colombia and its ally, the US, of planning an attack. A BBC correspondent says the potential for conflict is heightened. Colombian Defence Minister Gabriel Silva announced the formation of a new base in La Guajira in the north, near the Venezuelan border. At the same time, the Colombian army activated the new airborne battalions, which are equipped with US helicopters. 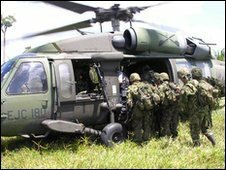 The helicopter fleet, made up mainly of Blackhawks, now numbers 120, making the Colombian Army Air Corps the best equipped and most experienced in Latin America, the BBC's Jeremy McDermott in Colombia says. President Chavez has criticised a pact announced last month allowing US troops to use several bases in Colombia. Mr Silva said that the new base would have up to 1,000 soldiers. It would, he added, also have a care facility for indigenous Wayuu people who live in the area. Since Venezuelans were told by Mr Chavez to prepare for war and the Venezuelan army starting blowing up bridges that link the two nations, Colombia has been overhauling its defence strategy. Until now this strategy has been geared almost exclusively to fighting the country's 45-year Marxist insurgency. With the increasing build-up of military on both sides of the border, the potential for conflict is heightened, particularly when one considers 2,000 rebels in the border region prepared for a fight between the two nations, our correspondent says.